Sharon has been attending peer support groups at Disability Network for more than twenty years. She enjoys the camaraderie, as well as the opportunity to learn new things, meet people, and attend local outings. Sharon finds the support groups offer a safe and comfortable environment for people to share their experiences. When she was having a difficult time with depression, the support groups gave her a reason to get out of bed and an opportunity to focus on something positive in her life. Sharon has been an active member of the Brain Injury Survivors Group for many years and joined in celebrating the group’s thirtieth anniversary this year. We are in the midst of our annual campaign and we are counting on your support! 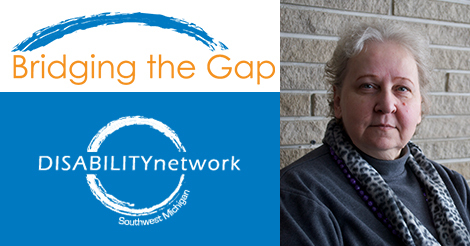 You can read more stories of how we work to bridge the gap for people with disabilities in Southwest Michigan on the Telling Our Stories page of our website Use the button below to make an on-line donation now or mail your check to Disability Network Southwest Michigan, 517 E. Crosstown Parkway, Kalamazoo, MI 49001.